We'd like to wish all our visitors - there are now over 1.000 of you every day! 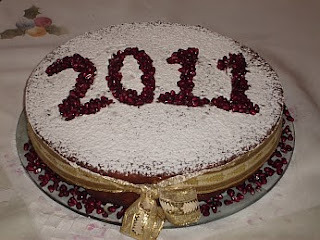 - a peaceful and prosperous 2011! You can see the Vassilopita we made this year in the photo. The 2011 has been made out of pomegranate seeds - in Greece the pomegranate is good luck at New Year and we break one on the floor / ground to bring the house luck for the whole year. Below, you can listen to the traditional New Year Carol - Protochroniatika Kalanta.